The recently launched documentaries by Hulu and Netflix covering 2016’s Fyre Festival debacle give us a great lesson on how the use of color can influence buyers. Back then, festival promoters paid social influencers to post a bright orange square on Instagram that contained no branding or imagery whatsoever in order to catch the eyes of millenials eager to be part of the next big thing. The wordless color block was a brilliant way to stand out in cluttered social feeds and it spread like wildfire (or “wildfyre” in this case) and duped many into paying thousands of dollars to attend an event that ultimately never happened. This marked a tipping point where bold color and clean design increasingly began to flood into every medium imaginable as corporations, influencers and artists alike looked to get noticed. Today, bold and colorful minimalism continues its prominence in the digital design world, appearing on websites, app interfaces and social media. Vibrant backgrounds with simple type overlays, solid color callouts and intensely-hued photos are frequently being used to influence visitors’ moods and behaviors – even by us. In 2019, that means our color choices are more important than ever. No discussion of color trends can begin without at least mentioning which shade Pantone (the New Jersey-based color matching sytem gurus) have named as their color of the year. After exhaustive research covering all areas of design, entertainment, fashion and travel, Pantone left no gray area when they boldly declared that the top color for 2019 will be PANTONE 16-1546, also known as… Living Coral. Why did they pick this “coral hue with golden undertones” – as Graphic Design USA describes it –that’s much more than peach and not quite pink? Leatrice Eiseman, executive director of the Pantone Color Institute, told the Pittburgh Post-Gazette in December that consumers are, “craving human interaction and social connection” and that “the humanizing and heartening qualities displayed by the convivial Pantone living coral hit a responsive chord.” Hmm… that sounds eerily similar to the psychological effect that made so many millenials impulsively tap those bold orange squares in 2016. Looking for ways to work Living Coral into your brand’s design scheme? Check out Pantone’s Living Coral Palette Exploration for color ideas. Pantone has also declared bold hues such as Lime Green and Hawaiian Ocean (both of which you may have noticed on the new Ridge Marketing website), Flame Orange, Fuschia Purple, Cherry Tomato and Blazing Yellow among 2019’s hottest hues. To me, it’s fairly black and white that the trend towards bright, cheerful and bold colors will continue to saturate the market. With that in mind, let’s look back at the psycological effects of an entire spectrum of colors that now include my favorite Pantone hues of today. Whether we’re red with anger, green with envy, or feeling a little blue, we often draw upon color to depict our moods and define our world. If color permeates our everyday language, it’s even more important in our visual communications. Don’t be afraid to use it. People respond to color, and the more daring you are, the more vibrant and exciting your visuals will become. When choosing a color scheme, it’s important to stand out from the crowd. If most of your competitors have chosen blue as their primary color (a common occurrence with software companies), it would be wise to go in a different direction. Trouble choosing a palette? Break out the color wheel. Direct, split, triad and analogous schemes have been used for centuries. They really do work and they’ll help you think of combinations you’d never otherwise dream up. 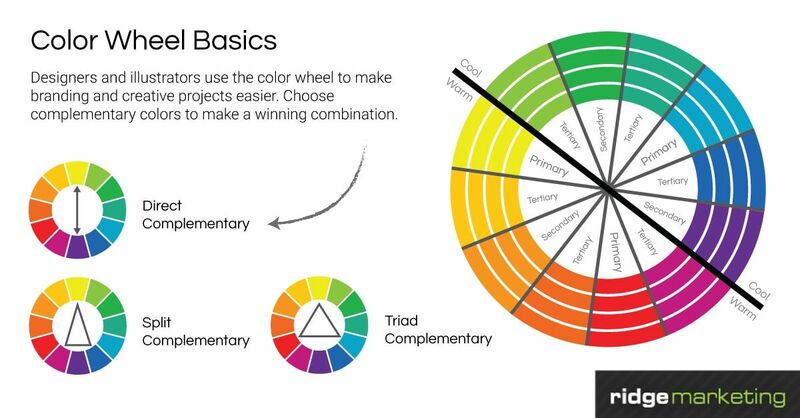 There are countless online color tools out there to help come up with a color palette. One of my favorites is Paletton. Just like musical notes, color combinations, tints and shades are endless, so get creative! Red: Symbolic of heat, danger, power, passion, strength, blood and war. Red evokes feelings of creativity and assertiveness or even anger. It can stimulate people to make quick decisions and increase expectations. Orange: Orange is the color of warmth, autumn, fire, creativity, innovation and speed. Orange tends to have a broad appeal. It can serve as a neutral color when toned down. Yellow: Another warm color that can remind us of a sunny day. Conversely, yellow also denotes caution, sickness or jealousy. Another good neutral when not saturated. Green: A strong color, signifying vitality, growth, energy, faith and money. Green is the color we most often associate with nature, giving it a calming effect and associating it with ecological responsibility. Lime Green (a 2019 Pantone Color): Creative software provider Adobe says this 2019 Pantone hue is, “a little bolder, a little brighter, and a little more vibrant—which adds a fun, youthful spin that you won’t find in more subdued variations.” Where you will find it is all over the recently rennovated Ridge Marketing office and website. Blue: Evokes feelings of trust and loyalty. Blue can create an innovative or technology-driven feel. Considered by experts to be therapeutic to the mind and body. Conversely, blue can represent solitude or sadness. Hawaiian Ocean (a 2019 Pantone Color): This shade of blue is more calming than traditional blues, evoking the Hawaiian ocean just as its name implies. According to Adobe, "If you want to inspire a sense of peace in your audience, Hawaiian Ocean is a solid choice." For this reason, we use it heavily through this very website. Purple: The color of richness, power, honor, and sensitivity. In the ancient Grecco-Roman world, Tyrian purple dyes were only affordable to elites, so purple became associated with royalty. It is also a color of passion and love. Fuschia (a 2019 Pantone Color): Introduced by a French dye manufacturer in 1859 as an alternative to the then-overused mauve, this pinkish-purple color was made to get noticed. It evokes femininity, passion and reminds us of tropical flowers. Brown: The color of family, it creates a feeling of security. It brings out our inquisitive nature and creates a neutral environment for open discussion. Brown communicates credibility, stability, and an “earthy” quality. It can also embody physical pleasures like food, luxury, and relaxation. White: A combination of all of the colors in the spectrum of light, white is symbolic of purity, chastity and cleanliness. It can signify a new beginning or awakening of spirit. White space can be used to lend greater impact to the content it surrounds. Black: The absence of color in the light spectrum, nothingness. Associated with death, sadness and otherworldly beings. A powerful and formal color, it can be intimidating to some. When used as a background color, black will make almost any other color stand out and appear vibrant. It can also project a hip or trendy attitude. So don’t be afraid to use lots of color in new ways – you’ll be tickled pink at the results! Now, orange you glad you read this article? This article was originally published on July 22, 2011 and updated by the author, Rob Quincy, on February 15, 2019.